Debates about structural racism within German police forces reemerged, once the public came to know details about their criminal (non-)investigation practices related to a series of slayings perpetrated by Nationalsozialistischer Untergrund (NSU). The same applies to the fatal enmeshment of German intelligence services with neo-Fascist structures through undercover informants, again in the NSU context. Heretofore though, the role of police and intelligence services has been, if at all, discussed from a solely German perspective. The event series ›Insight NSU‹ fills that gap in looking at the NSU trial in Munich and at neighboring European countries confronted with similar challenges by inviting experts from the UK, Northern Ireland, Turkey, Greece and Hungary. Greece: The Case of Golden Dawn. In March 2015, the Greek judiciary announced to start proceedings against the neo-Fascist party Chrysi Avgi (Golden Dawn) on April 20 this year. In total, 69 party members are charged with building a criminal gang in order to accomplish their political aims with armed assaults, protection rackets and murders. Obviously, there has been cooperation between state authorities and neo-Fascists in Greece, too. The Athens-based lawyer and joint plaintiff in the Chrysi Avgi trial, Thanasis Kampagiannis, will discuss similarities and differences between the trial in Athens and in Munich with the Kiel-based lawyer and joint plaintiff in the NSU– trial, Alexander Hoffmann (RAV). Moderated by: Annika Eckel, Koordinierungsstelle Lichtenberg. 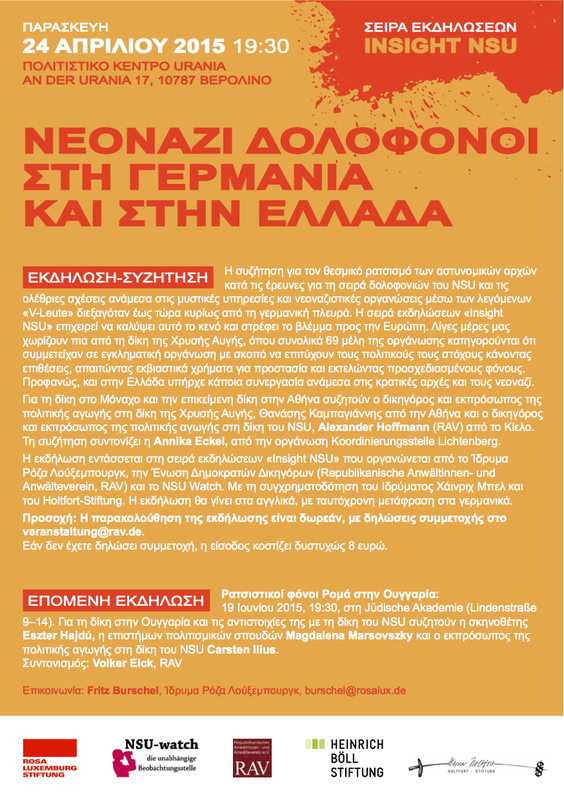 ›Greece: The Case of Golden Dawn‹ is part of the series ›Insight NSU‹, organized by Rosa Luxemburg Foundation, Republikanischer Anwältinnen- und Anwälteverein (RAV) and NSU Watch; co-financed by Heinrich Böll Foundation and Holtfort Foundation. English-speaking event with simultaneous translation. Please register via [email protected] to allow for free entrance; otherwise, admission will be 8 Euro. Already on Thursday, 23 April, 2015, 7:30pm the RAV and NSU watch will screen the documentary ›The Cleaners‹ (2012, director Konstantinos Georgousis will attend the screening) at Mosaikraum, Oranienstraße 34 (backyard entrance), subway station Kottbusser Tor. 13/04/2015 in International, NSU, Δίκη Χρυσής Αυγής.